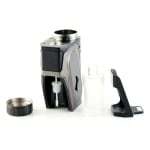 The Capo Squonk is the bottom feeding version of the Capo 100 from iJoy. Compatible with 21700/20700/18650 batteries, and fits tanks/RDAs up to 25mm in width. A compact regulated squonk box. 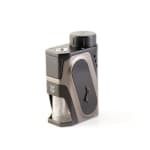 The iJoy Capo Squonk is the bottom feeding version of the original Capo 100. 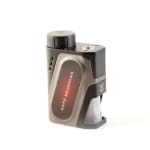 This compact 100W device with top down battery cap can be natively powered with a 21700 or 20700 cell, or using an 18650 cell with the adapter (batteries not included), and fits tanks or RDAs up to 25mm wide. A large responsive button fires atomizers in the resistance range of 0.05ohm - 3.0ohm, and the OLED screen displays atomizer resistance, battery life, and power. The Capo Squonk includes a unique 9ml clear e-liquid resevoir made from a mixture of hard and soft silicone, and a common soft 10ml e-liquid resevoir. The bottle slides over a metal feeder tube that connects directly to the spring loaded 510 pin, and is held in place by a magnetic door. A micro USB port supports battery charging; however, an external charger is recommended.